WordPress taxonomies are used to create relationships between posts and custom post types. For example, "tags" are used to created a relationship between posts that share a common topic. "Categories" do the same but are hierarchical and can even share relationships within themselves. Don't let the complexities of taxonomies scare you though. TypeRocket makes using them simple and easy so you can quickly reap the benefits of custom taxonomies. You can create a custom taxonomy with the tr_taxonomy() function. Using the tr_taxonomy() function will take care of the basic settings for you including pluralizing labels. 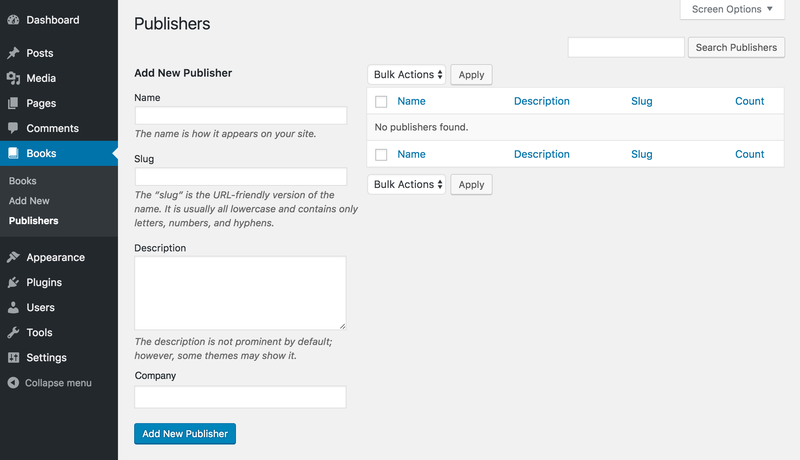 Take a look at creating a Publisher taxonomy you can use for a "books" post type. This one line of code adds the taxonomy to the admin, sets all the correct labels in the navigation and applicable places, and implements the required WordPress hooks. In some cases, you will not want TypeRocket to manage the grammar for the taxonomies plural form. You can set your own by supplying it as the second argument when creating the taxonomy. To add a custom taxonomy to a post type you can use the addPostType() method or the apply() method. To make a hierarchical taxonomy use the setHierarchical() method. By default, TypeRocket will use the taxonomy ID as the slug for the URL rewrite rules. You can change the slug with the setSlug() method. The ID is used to specify the name that WordPress associates with your taxonomy. It is also registered under the ID. When you register "Publisher" with TypeRocket the id is set to "publisher". You can change the ID using the setId() method. There is a single place to add custom content within the <form> element for each taxonomy. You can open up this sections with the method: setMainForm() for placement on the taxonomy creation and editing pages. Take a look at opening up a content section and adding a custom field. Note, when you make a custom field for taxonomy terms you must create a model and controller for TypeRocket to save the data as expected. You can make a controller and model quickly with the Galaxy CLI. There are five methods to set and get arguments. Arguments are used when the taxonomy is being registered. All arguments can be found in the WordPress codex. Take a look at using all the methods without effecting the already set values.